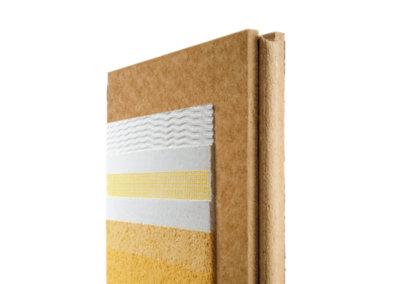 for protecting the bottom edge of your external insulation system. great for providing a clean drip edge at the bottom of your insulation. UdiBASE Plinth base track is designed to provide a robust edge strong enough to take wear and tear associated with ground level installations. This rail is normally installed just above DPC level on a house or at least 150mm above ground level. UdiBASE Plinth base track should be fixed either to solid masonry with screws and plugs or by fixing back to the sole plate on timber framed structures. Start by setting out a level at the desired height, either with a string line or a laser level and then simply follow the line with the bottom edge of the track. Once installed make sure to fit the UdiBASE plinth edging strip before the insulation boards to create the perfect drip edge detail. Where there is a gradient in the ground level at the bottom of a wall you can either step the track or slope it with the ground. If it is sloped, cut the first course of boards on and angle to correct the slope so that their top edge is horizontal again. For more information see our how-to videos. Each length of UdiBASE Plinth base track is 2.5m long and the pieces can be joined so simply measure the total running amount required. Each length of UdiBASE plinth edging strip is 2.0m long. Here you can see the UdiBASE aluminium plinth with the Diffutherm board sat in it and the Baumit render system coming down to the edge. The edge of the plinth is finished with the UdiBASE drip edge profile which forms the drip and also joins adjacent pieces of base track together. UdiBASE plinth starter track and Plinth edging strip costs are as per the below. Cost do not include VAT or carriage. Carriage is typically calculated at £25 + VAT for up to 20 lengths This price does vary if delivery is required to remote locations. If you require only a few lengths we may be able to get slightly cheaper shipping so please contact us for a more accurate price.